The impetuous Arachthos river, the ancient Inachos was the big obstacle for the transfer of the habitants and the big flocks of the shepherds of the region of Tzoumerka. Many people and animals died in the impetuous river of Arachthos, to the point where flows from its steep gorge, at the location of Plaka in Raftanaioi. Former attempts for the construction of the bridge failed. 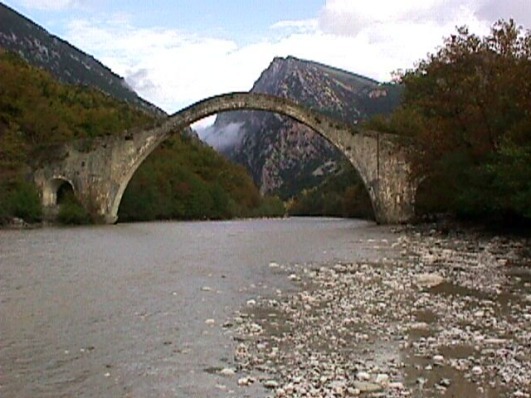 In 1863, on the day of the inauguration of the bridge, it fell into the river-bed of Arachthos. Later, the builder Kostas Mpekas from Pramanta took over its construction and to build it according to his plan. With many fundraisings there were gathered about 187.000 turkish coins and in 1866 te bridge was finally built, an arch bridge of 40 m. length and 20 m. altitude. 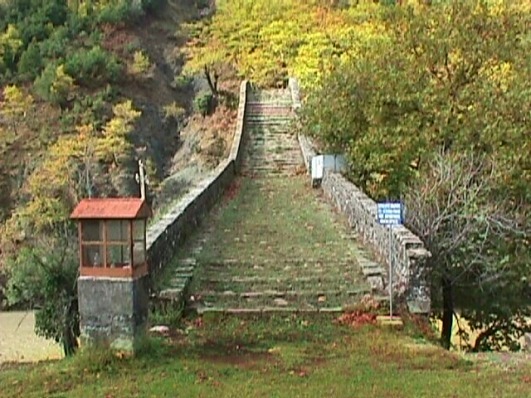 It is the biggest arch bridge in Epirus. On its edges has also two smaller arches, of 6 m. length. ΕIt is an excellent piece of art, and many admired it and still admire it. Beside the bridge there is the old Inn, whre during the civil war it was signed the “Treaty of Plaka“, among the resistance grous od E.D.E.S. and E.L.A.S. so at cease the warfares among them. The whole transport is done now by a new-constructed bridge, just a little further by the old one, leaving it alone and isolated, but always proud. The bridge was demolished on February the 1st. in 2015 because of the strong weather effects and the strong rain that stroke the wider area of Epirus. Since then have become many attempts for its reconstruction by the prencict of Epirus with the contribution of the ministry of Culture.